Photo Kathmandu 2016 continues its tradition of recognizing individuals who have dedicated their lives to the growth of Nepali photography. Last year, the festival recognized Mani Lama (click here to watch the video), one of the most influential photographers in our history, renowned for his landscape and portrait photographs used by development organizations. This year an independent Award Committee reviewed over a dozen nominations and has decided to give not one but two awards. Starting this year, the awardees will receive a sum of Rs. 50,000 per person. We are honoured to announce that the Photo Kathmandu 2016 Award of Excellence goes to Mr. Shreedhar Lal Manandhar and Mr. Kiran Shrestha. Shreedhar Lal Manandhar was born in 1940 in Dugambahil, Kathmandu. Shreedhar Lal Manandhar was and still is an inspiration to a whole generation of younger photographers. His photography ranges from commercial, to nature and landscape to journalistic, all equally influential In the 1970s, he travelled to Lomanthang with a friend and later to Everest Base Camp alone where he photographed landscapes. The American Embassy began assigning him to shoot cultural and diplomatic events. His clients included popular hotels such as Phulbari, Yak and Yeti and Hotel Annapurna along with numerous travel agencies. In the 1980s, he free lanced for United Press International, worked as an in-house photographer for Nepal Travel Magazine and contributed photographs to Swatantra Bishwo Magazine. His photograph of late king Birendra’s coronation in 1975 was published in newspapers and magazines all over the world. He was the one of the first Nepali photographers whose work was featured in international media. It is unlikely to imagine the history of photography in Nepal without someone like Shreedhar Lal Manandhar. The wealth of photographs he has contributed is invaluable to our attempt to understand and document a history of the Nepali people. Kiran Shrestha was born in 1954 and is a self-taught camera repair technician based in Lainchaur, Kathmandu. He has been repairing cameras for the last twenty-five years. He used to repair telephones, emergency lights and other electronic devices until he successfully repaired a camera that someone dropped off at his store. He then developed an interest in understanding the mechanics of the camera. Soon enough, he was repairing only cameras and was one of the very few camera repair technicians in Kathmandu. Photographers could continue to work because Kiran Shrestha was able to fix their equipment for them. 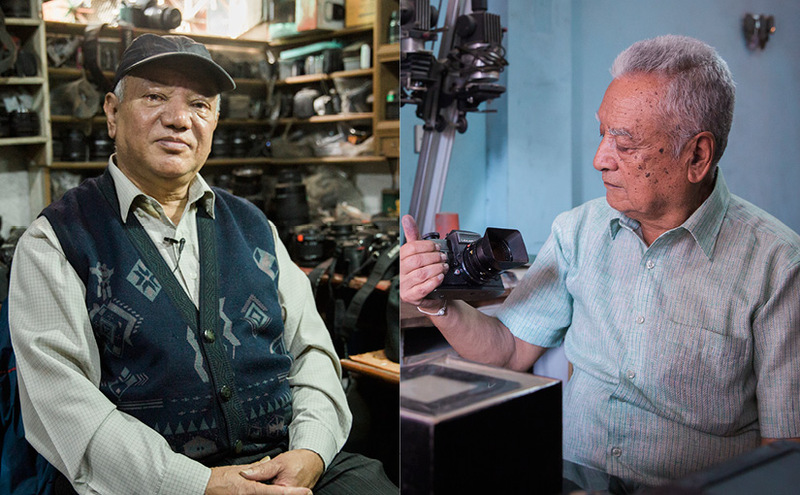 Usually, photographers, both professionals and hobbyists bought second hand cameras and took them to Shrestha for repairs. Shrestha’s passion and honesty made it possible for photographers to continue to pursue what was then an expensive profession. Shrestha continues to learn about new technology in the market and advises photographers about cameras. His contribution to the evolution of Nepali photography has been immense. Kiran Shrestha is an enabler, a quiet hero and a champion for Nepali photography.